How to Improve Your Literacy Block… a 3 part series! perform poorly on an assessment? It was happening WAY TOO OFTEN in our classes! We would give the direct instruction lesson, do a little pair share, give a handout, maybe another handout the next day, talk about it the next day and give an assessment and wonder why our students were not scoring at a proficient or advanced level! It was time for my formal evaluation and I was writing out my typical lesson plan. Totally predictable and totally average. I stopped and thought to myself, “If my students aren’t scoring proficient or advanced, it doesn’t matter how great this individual lesson looked for an evaluation. The bottom line was that it was not getting the job done. I had to change!” I decided that I would shake my class up a bit and try something new. Because my evaluation was in four days, I had to get my students trained FAST! The problem was that our students were not getting enough exposure to the standard. We decided to create Literacy Centers for the standards that we were covering in our unit. We would focus on one standard and have students rotate through the six stations in 15 min intervals. We pulled apart each standard into its different components and designed a Literacy Center around it. This way, we could assess the output from the students and evaluate which part of the standard they were not grasping. Each Literacy Center needed to appeal to different modes of learning. We all know that students learn in different ways, so Literacy Centers need to address the different modes! Here are the six Literacy Centers that we developed. Our first center is Close Read. This center is teacher led and examines a passage closely. Students read, discuss, and examine the text’s contents. This guided reading group is our favorite! The second Literacy Center is the Game. Students love games! Games vary from Matching, to dice games, or even Headbandz. Students love learning with other students! The Note Taking Literacy Center has students create three column notes. Students fill in a variety of information based on what is asked of them. The Sort Literacy Center has students practice examples and non-examples. Again, manipulating the content is powerful! Our Art Center is for students who learn best from visuals. They are asked to draw the concept on their “canvas” and create a short writing piece. The last Literacy Center is Writing. Students are asked to write showing their knowledge of the standard in their writing. Take a look at what the Literacy Centers look like in our classrooms. Here is the most important component to Literacy Centers! We all know that we have different groups of students in our classroom. Everyone learns at different paces and we need to accommodate these needs in our classrooms. The most powerful component of these Literacy Centers is that there is a way to DIFFERENTIATE at each center! If you look at the image above, you can see that the pair on the left is at a lower level of understanding than the pair to the right. One asks for a definition, while the other asks students to apply the meaning to a scenario. The differentiation has been done for you! All you need to do is group your students accordingly! for GATE students or Intervention! at whatever level you need! The last part that we feel that we have to tell you is how the observation went! Let’s just say that I met all of the teaching standards with flying colors. My evaluator loved the conversations students were having, how engaged the students were, the differentiation and the rigor of the content. She even asked if other teachers could come in to see what we were doing in our classrooms and that this is what great teaching looks like. We can also tell you that our students LOVE it when we use these centers. When they walk into the room and see them on the schedule, we hear, “Yesssss!!!!! 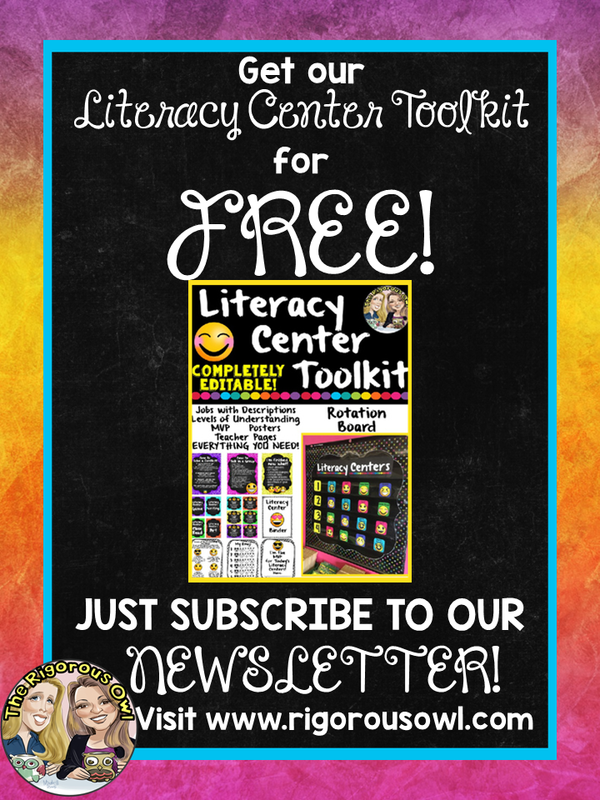 I loooooove the centers!”If you are interested in learning more about Literacy Centers, you have come to the right place. This is post #1 of a 3 part series! Our post #2 will be all about HOW to run Literacy Centers. Post #3 will be all about where Literacy Centers fit into the sequence of teaching a standard. Be sure to subscribe to be notified and follow us on Instagram! but you will get a feel for some of the centers. Detective Mystery Unit Made Easy! If you are someone who loves classroom transformations and engaging students while they are learning, you have just cracked the case wide open! In this blog post you will get to go behind the scenes with us to see how we set up, planned, and operated our Detective Mystery Unit! Be sure to check out the Freebies, Tips, and Enter our Giveaway! The first task that you face when you plan for a fun unit like this, is getting into character! We do everything as a team at our school, so the three fourth grade teachers plan and work together. We all participate in the events together! If you don’t do this with your team, this is a great time to start! We started our Detective Mystery Unit by simply getting each teacher a badge off of Amazon. Our next stop was to the Dollar Store to find some fancy aviator sunglasses…. and just like that, we were transformed into Detective Brazeal and Detective Devlin! We also made sure that we used detective vocabulary throughout the day for our gumshoes! If you need some ideas, Click the button below for a Detective Vocabulary Freebie! Mystery and Detective Vocabulary Cheat Sheet! The next thing that we decided that we HAD to have was a crime lab to book our evidence into. Instead of transforming three classrooms, we decided to have all three teachers set up one crime lab. Our perfect spot was behind the curtains of our stage in our MPR. No one would even know it was there, except for our junior detectives. Also, if we wanted a small group activity, one class could go inside, but if we needed all three classes to participate, they could sit in the MPR and look into the lab. If this is not an option for you, maybe there is an empty classroom at your school that could serve the same purpose. We loved this idea because our unit was an entire week long, and this way, we didn’t have to be in this dark lab for an entire week! Check our YouTube video out below to get a feel for it! You Tube Video of our Crime Lab! This crime lab is not as hard to set up as it seems. The first thing that you will need is black plastic sheeting. Here is what we used Click Here. We simply used a staple gun and lined the area. The only other thing we bought were our detective cardboard boy and girl and the footprint stickies from Oriental Trading. The rest of the supplies were found around our classrooms or school. We already had black lights, cation tape, and we found the cool items on our lab table in our science materials kits. The glowing liquid in the test tubes is made from glow in the dark paint that one of the teachers had at home. We already had the flashlights that the students are holding in the picture because we do Flashlight Friday reading, which we purchased from Amazon. Overall, it looks like a lot, but when you have three teachers making one lab, you have more resources to pull from! The main purpose of the Top Secret Crime Lab is to build excitement for the students! It is so amazing to hear them shout out, “Wow!” “Ahhhh!” and “That’s Awesome!” Immediately, they are hooked. Buy in. It’s as simple as that. If students are engaged, they will be more motivated to complete the academic tasks that you present for them! Another reason is for your excitement! It is so rewarding! We were excited to get to work each day and pumped when it was time for our Lab time! Okay, now it’s time for the good stuff. The first question you need to answer is, “What is the crime going to be?” If you are doing the unit with multiple classes, you will need to find something that all of the classrooms have in common. Since we were reading Bunnicula, we decided to buy a small stuffed rabbit for each classroom. We really wanted them to value the rabbit, so we made it our class pet. We brought in a pet carrier, gave him a blanket, laid out some food and water, and made sure he was securely locked in his cage every day before heading home. If you know the book, then you will get why there is a white pumpkin nearby. We also left the book for him to read at night. After we were done reading our book, it was time for the crime to occur! Bunnicula mysteriously disappeared overnight! When the students walked in to the crime scene below, they were devastated that their beloved class pet was missing! And just like that, we had The Case of the Missing Bunnicula! For those of you who have not read about our Year Long Plan, you might be unfamiliar with the way we teach. Each of our units lasts one month. If you are interested in seeing our Year Long Plan (which we highly recommend), check it out by clicking here . In each unit, we teach four main standards… one from each domain. Here is what we were teaching during this unit. During our Engaging Scenario (what you are reading about), we complete one task from each domain each day. The Engaging Scenario lasts for a total of five days. FREEBIE: REPORT AND SKETCHING. Click the button below to get it! Their first task was to make a sketch of the crime scene. Then, students had to write a report describing the scene. In their report, they had to circle all prepositions and underline all of the prepositional phrases. Describing the crime scene is absolutely PERFECT for Prepositions and Prepositional Phrases! *On a side note, this engaging scenario is done after the concepts have already been taught and practiced. The next step was to book all of our evidence into our lab! Students used gloves and placed items from the crime scene into baggies. All of the 4th grade classes came together and debriefed. We talked about what was seen in each classroom (all the same) and what we thought our next actions should be. As a group, we decided that it was time to canvas the campus and start gathering tips! Students created posters that listed basic information about the crime. In this poster, they had to include five prepositions and prepositional phrases. Again, the prepositions were circled and the prepositional phrases were underlined. On the posters, students advised witnesses to contact our Crime Hotline with any tips that they had. Each student made a poster and they were plastered all over campus! Talk about building excitement! The whole school was buzzing! Want to try some of these activities for FREE???? Click Here! For the Tip Line, we wrote eight short scripts for eight different callers. Click the image below to get the script of the 8 callers for FREE! Various staff left these messages on our voicemail portraying eight different character traits. When our students came in the next day, they received the piece of paper in the image above. We also have it available for FREE by clicking on the image below! We told them that we had several new messages that needed to be investigated! They were hooked! With each message, students had to assign a character trait and list the evidence that supported their claim. Most of the messages were pointless and led nowhere, but several fed the students ideas about what they should do next in their investigation. From the hotline, we created a suspect list. Our first thought was to make a list of everyone that had access to all three rooms. From there, we focused on the time of the crime. Our custodian report that he saw the bunnies at 4:30pm. This dwindled down our suspect list to six suspects. A Top Secret envelope was placed on each of our doors with a black light message inside. Students came together to examine the messages. Students had to use their knowledge of Context Clues to decipher the messages! One of the notes said to check by the piano in the MPR for a very important clue. Students RUSHED over to discover it! This important clue was an invitation to a party that had a map on it. The students then interrogated the remaining six suspects and discovered that three of them lived in the area on the map. Our mystery now had three prime suspects! The next day, we focused on College and Career Readiness. We had an expert come in to close the case! Our forensic specialist came out and shared with the students all about the law enforcement career. Students took notes and asked some amazing questions! They loved this! At the end, we explained our crime to the expert and asked if he could pull prints from an item left at the scene. He pulled the prints successfully! All we needed was to collect prints from each of the remaining suspects and make a match! *If you are looking to add more College and Career Readiness to your classroom, you HAVE to check this out! Click Here! Our fingerprint match led to no other than our very own principal! The 4th grade class served our principal with a search warrant. After searching her office, our cherished rabbits were found safe and sound! Immediately, the students chorally read her her rights and our principal was booked! When asked about her motives, our principal told the students to look inside the basket. We discovered that our cute little bunnies were holding rolled up papers! These rolls ended up being diplomas from Bunny Obedience School! When our principal explained, she told us that she heard our bunnies might be vampire rabbits (If this sounds a little crazy, read the book! You’ll love it!). She didn’t want anything to harm the students at her school because safety was her top priority. She decided that she would send them to a four day obedience training and she didn’t want to tell us because she wanted them to finish their training. Talk about an amazing principal, right?! Our students immediately forgave her and released her! The next day’s focus was on Poetry Elements. We had fun with fingerprint poems and pulled out all of the elements from some detective poems. And there you have it. A Fun and Engaging Detective Mystery Unit. The students were able to practice and apply all four of our main concepts that were in our month’s unit, while having a blast! Want to know the best part? We can’t wait to do it again! WANT THIS MYSTERY AND DETECTIVE ACTIVITY AND DECOR BUNDLE FOR FREE?! Want Some Detective Fun in Your Room? Mystery and Detective Activities, Decor and MORE! BE A BOSS at FLEXIBLE SEATING! Welcome to the first post of a two part blog post series on Flexible Seating! ONCE YOU EXPERIENCE FLEXIBLE SEATING FOR YOURSELF, YOU WILL NEVER GO BACK! In this post, you will see our types of seating, how we enter our classroom, where students store their materials and how students are introduced to the idea of Flexible Seating! Here are the types of seating that we have available in our room. We did not start out with everything you see in the pictures here. We started small and continued to add more and more options. Some of our first seating options were: yoga balls at desks, a lowered kidney table with pillows, lap desks, and spare rolling chairs. These seating options are all extremely low priced items. Once our administrator saw our Flexible Seating classroom, we were given 4 wobble stools. These were a bit pricier, but your school might have funding for them or there is always Donors Choose. Our advice to you is to not let the fact that you don’t have the pricier items stop you! Start off simple and build over time. Later, we added in bean bags, bean bag chairs, cushioned crates, scoop rockers and our favorite… a couch! Here are some action shots of our students! All we think when we look at them working, is WHERE WAS THIS WHEN WE WERE IN FOURTH GRADE?????? RIGHT?! We mean, COME ON… They look so comfortable! While you are looking at these pictures, you might be thinking to yourself, “Where is all of their stuff? They don’t have a desk, so where is it?” Great observation! This took some time to figure out! We can’t wait to show you what we came up with! …and by the way, we have to tell you that the fact that students do not have a desk is AMAZING! There are no more messy desks or the famous excuse of, “I left it at school in my desk!” For the desks that we did keep in the classroom, we turned the sides that open toward each other so that students cannot use them. The bonus is that I get to use the desks for added storage! Our students do not keep their backpacks in the room. Students empty their backpacks and keep them outside. This reduces the amount of clutter in your room and keeps you from tripping over bags all day. The next thing you need to know is that we are an AVID school. All of our students have binders, which we think is IDEAL for the Flexible Seating classroom! Students keep all of their materials inside this binder. We have found that three inch binders are the perfect fit for our needs. In the binder, students have their pencil pouches with supplies, dividers for each subject and paper. The binders travel with the students and they use them for a flat surface to write on. Here is our Supply Station. The material baskets on the top shelf are community supplies. If students need supplies for the day, they are available for rent, since we use a classroom economy system. The pencil boxes on the second shelf are called their “Safety Deposit Boxes.” Students keep spare, or back up materials, in these safety deposit boxes, so that they are always prepared. THESE HAVE BEEN THE BEST ADDITION! On the bottom shelf, you see student book bins. Students keep books or items that we do not want leaving the classroom inside of them. This is also where we pass out supplies or papers if the students are not in the room. Attendance in the Flexible Seating classroom isn’t as easy as when you have a desk for each student and you can just quickly see who isn’t there based on an empty seat! To avoid calling each student’s name every day, We have the students move their magnet as they enter the room. At the same time, your lunch count is also done for you. Simply count (or have a student count) how many need a lunch and note the magnets that are left at the top and you’re done! If you look at the picture to the right above, you can see that we have laminated a paper that says, “Absent” and “Lunch Count.” A student does this job each morning and leaves it on our roll book, ready to be marked! If a student is absent, we simply clip the day’s papers on the bottom of our board for them to grab first thing in the morning. A folder on the counter would serve the same function, but this way, it’s out of your way! Our boards, as you can probably tell, are just cookie sheets! Here is a video of our students entering our classroom. One of our students is the “Host.” The host calls different groups of students in at a time. This solves the problem of students making a mad dash for the favorite seats and provides everyone a chance at getting first dibs. The arrow on the left hand side is attached to a clothes pin. The clothes pin gets moved down to a new group each day. No more arguing!Super simple… and better yet, this sign is a FREEBIE in our store! Click below to grab it for yourself! Want to Customize the 1st Choice Seating Chart? Grab this EDITABLE VERSION! Click the image! Sit Spots have seriously been amazing in our Flexible Seating Classroom! Direct instruction can become problematic when students are spread all over the room, and sometimes tucked into corners. Whenever we are teaching whole class, students bring their binders in their laps and sit on their Sit Spot. Each student has their own assigned Sit Spot. This allows us to pair students up with ability based partners and we can even create groups based on the color of their Sit Spot. Sit Spots are the brightly colorful dots in the picture above. They are Velcro, so they are perfect for carpets! We do what we need to do whole group, and then the students return to their work area. Interested in Sit Spots? Click below to check them out! They even have a free sample that you can test out in your classroom! Here is what works for us in our rooms. This Flexible Seating Contract goes over our basic Flexible Seating rules. The contract is given to students and parents at the beginning of the year. It definitely takes time for students to catch on, but once they get it, it works! If we are being honest, there were many moments of frustration and feelings of throwing in the towel, but we pushed through our difficulties and made adjustments when problems surfaced. We can honestly say that Flexible Seating has transformed the way we teach and the way our students learn. The feeling that Flexible Seating creates in your room is one that you MUST feel for yourself. The classroom changes from a stuffy and formal environment to a cozy, personal environment. It opens the flow for communication and conversations that we have never had in our rooms before. You seriously feel like a family and you get to know your students better than ever! Not only will your students love Flexible Seating, but others will too! We hope that we have provided you with some tips and tools for you to use in your room! We would love to hear any questions or comments that you have in the Comments below! Looking for a way to communicate to others about Flexible Seating? We love using Flexible Seating Brochures for Parents, Students, Substitutes, and Classroom Visitors! Check them out by clicking the image below! Flexible Seating Options: Perfect for your Class! Ready for More on Flexible Seating? Welcome to our “Filling your Teacher Toolkit” series! Today, we are adding teaching Proverbs and Adages to your toolkit! Students come into our classes not having any idea what these are! Sometimes, students will say, “Oh ya, my grandma says that to me!” This is what gave us our theme!!! So grab your dentures and get ready to bite into something sweet! We teach our students that Proverbs and Adages are words of WISDOM believed to be true passed on through generations. Here is our anchor chart! In our class, we use “JOTs” to practice the concept we are learning about. Students create their JOTs in their Reader’s Notebooks. Students chose a proverb/adage from our list of 50, and applied them to a situation. They then created a picture of a little kid getting advice from their grandparent. Here are some student samples! Students then placed our 50 proverbs and adages around the classroom. They placed them in places that reminded them of the proverb/ adage. For example, students placed “time flies when you’re having fun” by the clock and “when one door shuts, another one opens” above the door. This activity serves as a visual for students to constantly see throughout the year that spirals back to our lesson of proverbs and adages! Another idea for Proverbs and Adages is to dress like a grandparent! It just so happens that we are in charge of student council, so we had the luxury of planning our spirit day… Dress like a 100 Year Old for the 100th day of school! It just so happens to have worked out perfectly with our proverbs and adages unit… imagine that!! I guess there are some perks to being Student Council leaders! Since the kids were all dressed up, we decided to use the Aging Booth App to turn our students into 100 Year Olds! Then we had them do this fun writing prompt! Students picked their favorite proverb/ adage and wrote to the youngsters about it. GET IT FREE BY CLICKING BELOW!!! To make it even more fun, we served denture treats! Simply apples, peanut butter and marshmallows! The kids loved it and we did too since it was so simple! Students also completed a classroom game of SCOOT with our GRANDPARENT THEMED TASK CARD ACTIVITY BUNDLE! Enter our giveaway below for a chance to win them for free!!!!! •A Colorful List of 50 Common Proverbs & Adages… Perfect for a Bulletin Board! •2 Sets of 25 Task Cards with Activities/ Extensions! 50 TASK CARDS IN ALL!!!!! •Fun Recording Answer Page: Students get to see which granny baked the most cakes! •Antonym Extension Activity: Students will find that within the multiple choices, there is also the opposite meaning of the proverb/ adage… A recording page to complete! •Fun Recording Answers Page: Students get to see which grandpa showed the most love! •Blank Task Cards: Students will create their own scenarios for a proverb/ adage… either one covered on the list of 50, or one from further research! Students can switch and complete!